Our Firm — Klamp & Associates, P.C. At Klamp & Associates, our intention is to provide affordable, quality legal services to organizations working to serve the public interest. We believe that the specialized needs of our nonprofit clients are best met by understanding and addressing potential legal problems before they arise. We represent clients of all sizes, and especially welcome small and medium-sized nonprofit organizations because we believe these organizations serve as the backbone of the charitable community. Our clients include charitable organizations, private foundations, membership societies, professional associations, international development NGOs, religious organizations, and other philanthropies. We maintain the trust and confidence of our clients by providing reliable and effective service. In 2014, Klamp & Associates took its commitment to the public interest a step further and became a Benefit Corporation under the laws of the District of Columbia. Please contact us for further information about the steps we have taken to promote the social good. We at Klamp & Associates know that finding the right attorney to represent you is a choice not to be taken lightly. That’s why we offer free consultations up to thirty minutes to walk you through your needs, the scope of your goals, and your budget. Carolyn A. Klamp is the founder of Klamp & Associates and has represented nonprofit organizations since 1991. She is a member of the Exempt Organization subcommittee of the Taxation Section and the Employment Rights and Responsibilities Section of the American Bar Association and has written about Delaware law as it applies to nonprofit organizations. Carolyn has written and spoken about the legal duty of care of international NGOs on numerous occasions, including for OSAC at the Faith-Based Conference (2016) and Africa Security Forum (2016), RedR UK at its Senior Level Security Seminar (multiple), InsideNGO’s Legal Advisory Council (2006 and 2007), InterAction’s Security Working Group (2013), the International NGO Safety and Security Network (2013), and the American University’s Washington College of Law (2012 and 2013). She has also presented on panels regarding other topics including funding AIDS projects worldwide, anti-terrorist financing, risk management, and employment issues faced by nonprofits. Carolyn graduated from Harvard Law School in 1986 and went on to help found the law firm of Dorn & Klamp before founding Klamp & Associates in 2007. She is a member of the bar in Maryland and the District of Columbia. 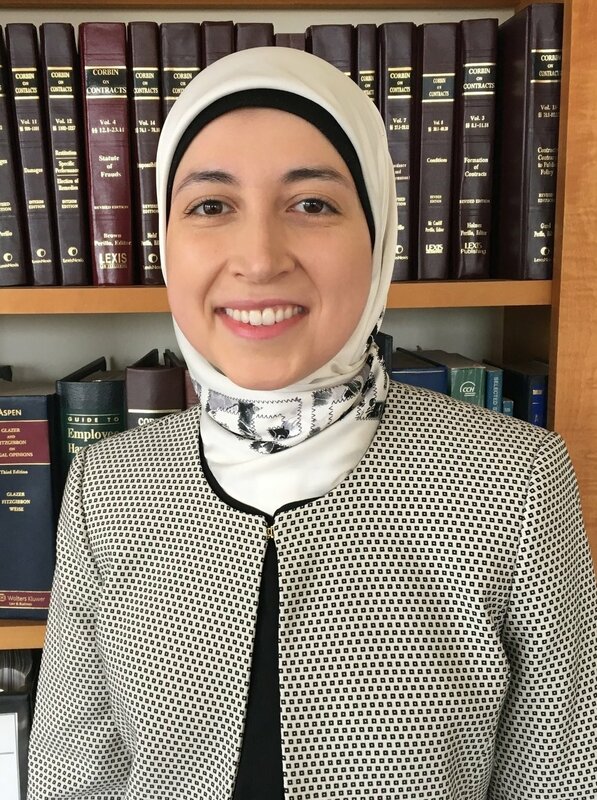 Iman Abdulrazzak is an attorney with experience both serving and advising nonprofits. As a Student Attorney for the Community and Economic Development Clinic at the University of Michigan, she advised nonprofits helping revitalize Detroit. She served as a AmeriCorps Attorney in Massachusetts, representing indigent clients in housing and immigration matters. She also served as a volunteer Director of a refugee assistance program in Michigan. After her hometown of Flint faced a contaminated water crisis, Iman served as the Lead Project Attorney for the Flint Water Contamination Class Action at the firm of Pitt, McGehee, Palmer & Rivers. In the past, she also interned at Amnesty International in Washington, D.C. Iman holds a B.A. from the University of Michigan - Flint and a J.D. from the University of Michigan Law School. Iman clerked for the Honorable Denise Page Hood of the U.S. District Court for the Eastern District of Michigan. She is licensed to practice law in Massachusetts, Connecticut, and Washington D.C. and has been admitted to practice in multiple federal courts. Victoria Frappaolo joined Klamp & Associates in June 2016. She holds a B.A. in International Relations from American University. Victoria completed her Law Degree and Master's in International Relations from American University's Washington College of Law in 2018. In the past, Victoria worked as an immigration paralegal and legal writing fellow. Lauren Ruvo joined Klamp & Associates in 2018. She holds a B.A. in Psychology and Communications from Boston College and a M.Ed. in Psychology from Harvard Graduate School of Education. Upon completing her master’s degree, she moved to Washington, D.C. where she worked as a Staff Assistant for the Ranking Member of the United States Senate HELP Committee. She is currently pursuing her Law Degree from Georgetown University Law Center. Lauren is Editor-in-Chief of the Georgetown Journal of Gender and the Law. Anna Benoit joined Klamp & Associates in September 2016. She holds a B.A. in International Affairs from the George Washington University. Prior to joining Klamp & Associates, Anna worked at USAID and Ishahayi Beach School Foundation. Mariana Lopez joined Klamp & Associates in 2018. She is a senior at The George Washington University, pursuing her B.A. in English and a minor in biology. Mariana has interned for PEN America among other nonprofits and hopes to continue to work for mission driven organizations after graduation. She is considering a future career in law. Lauren O'Neil joined Klamp & Associates in May 2016. She holds a B.A. in International Relations and Middle East and North Africa Studies. Lauren is the current CFO of Urban Refuge, a nonprofit developing an aid app for Syrians in Amman, Jordan. Prior to joining Klamp & Associates, Lauren lived abroad in Morocco and Israel, taught ESL, and completed a year of AmeriCorps service. Eleni Spentzouris has worked for Klamp & Associates intermittently since 2010. She holds a B.A. from Sarah Lawrence College; during her program, she was on exchange at the University of Oxford where she studied international human rights and disability law— reaffirming her desire to serve the public interest. She plans on attending law school in the near future. Randy Bareham is an NGO risk management consultant and trainer with over 14 years of experience in the humanitarian sector. He works with a range of organizations, from emergency and humanitarian relief, to development and human rights. His focuses on demystifying security management for practical implementation and maintenance at all levels within an organization, from local partners and field teams to management and HQ. His services include development of security systems and policies, security training at both personal and management level, and contingency and local security planning. By facilitating active staff involvement in the process at all levels, he helps organizations develop not only their duty of care but also a culture of security and a sense of organizational ownership in their security management processes. His experience includes Northern Nigeria, South Sudan, East Africa, Afghanistan and South East Asia. Randel has been consulting for K&A and its clients since its founding in 2007. He received BASc in Engineering and a B.A. in Psychology from University of Waterloo, Canada.